When you create a sequence, you can decide whether each email in the sequence is a reply to the previous email in the sequence, or whether each email will arrive as a separate email — with a unique subject line. If you want a follow-up stage of your sequence to be sent as a reply to the previous sequence — and have the same subject line — make sure that the toggle next to Send as reply is set to Yes. In the example below, the subject line of the first stage is "Your growth". The subject line of Stage 2 is "Re: Your growth", and you cannot edit it. If you want a follow-up stage of your sequence to be sent as a separate email, with a different subject line, make sure that the toggle next to Send as reply is set to No. In the example below, the Subject field is blank, and you can add a new subject. This email will not be threaded with the previous email(s) in your sequence. 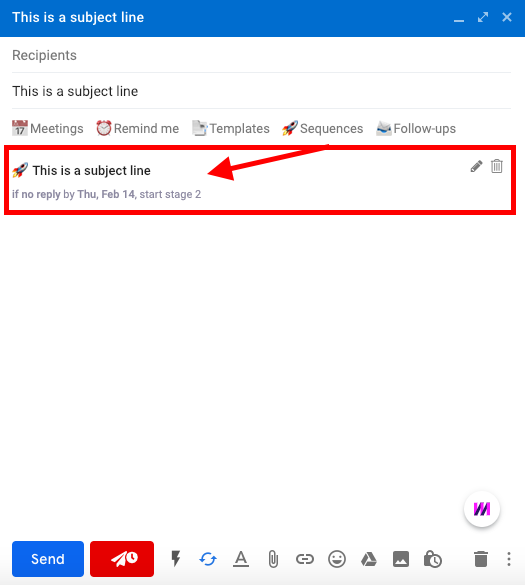 When you add a recipient to a sequence from Gmail by selecting the "Sequences" menu (top bar), each stage of the sequence will have the same the subject line as the message you are composing. On the Growth or Enterprise plan, you can change the subject line of your followup messages by clicking Edit next to the first stage of your sequence, then set Send as reply to No. You can then add a new subject for your follow up and subsequent messages in your sequence. Your follow up emails will not be threaded with the original email.